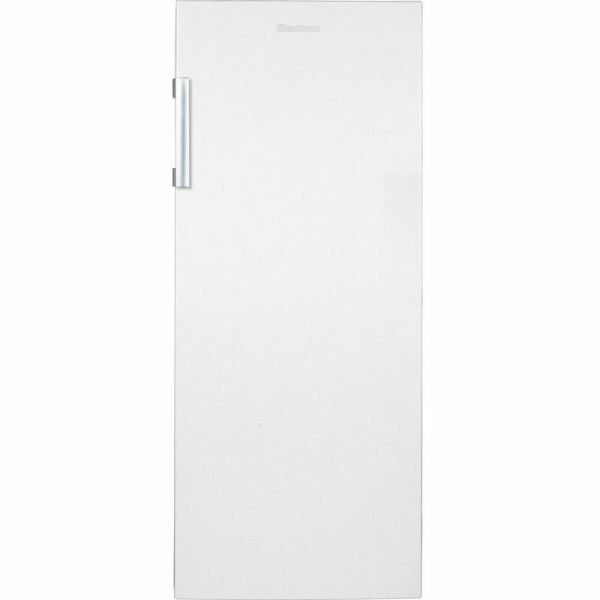 Product information "BLOMBERG SSM4450 TALL LARDER FRIDGE AUTO DEFROST"
The SSM4450 is a modern, high-tech larder fridge; as there’s no ice box, all the space is devoted to food storage. Keep your produce fresher for longer with Blomberg. Match this larder fridge with the Blomberg FNT4450 frost free tall freezer to create a side-by-side look – with the flexibility of two individual appliances. This tall, freestanding fridge is slimline, but still holds a family’s produce with ease. You’ll never struggle for room again, with a 252 litre net capacity, five shelves, and a large salad compartment. The glass shelves are easy to clean and stay cool, regulating the temperature of your produce. They are also easily adjustable, allowing you to move them around and store taller items in the main compartment. In addition, there are five height adjustable racks in the door compartment - ideal for storing eggs, condiments and other smaller items. The reversible door can even be altered for left or right-hand opening to better fit your space. Having different shelves for different food categories such as meat, dairy, and desserts, keeps your fridge organised and hassle free. There’s also LED lighting inside the SSM4450, which is brighter and more durable than standard bulbs. A large salad crisper gives you plenty of storage for all your fruit and vegetables and keeps them crunchy for longer. A chrome coated wire wine rack securely holds your bottles, and if the kids are partial to fizzy drinks, it can also hold two litre soft drink bottles. The SSM4450 uses auto defrost technology to regulate the interior temperature and ensure there’s no build-up of ice. An antibacterial door seal helps prevent bacteria from entering and forming in your fridge. It also stops growth around the door seals which are often overlooked when cleaning. With an A+ energy rating, the Blomberg SSM4450 is super-efficient, which keeps your running costs and electricity bills low. Emitting just 39 dB in noise, it won’t disturb homework time or your family conversations. Related links to "BLOMBERG SSM4450 TALL LARDER FRIDGE AUTO DEFROST"
Customer review for "BLOMBERG SSM4450 TALL LARDER FRIDGE AUTO DEFROST"